Introduction: Intertrochanteric fractures in the elderly are common fractures with high morbidity and mortality. Moreover, its surgical stabilization with early rehabilitation remains a persistent challenge. These patients have poor bone quality and conventional osteosynthetic procedures frequently lead to nonunion and metal failure. The primary goals of treatment are stable fixation and early rehabilitation. The aim of this study was to evaluate the functional outcome, complications of intertrochanteric fractures treated with trochanteric fixation nail (TFN). Materials and Methods: This retrospective study was conducted on the total of 50 patients with fracture intertrochanteric femur and treated with TFN from July 2011 to August 2016. The patients evaluated at 6 months, 1–4 years postoperatively and assessed using the Modified Harris hip score. Results: The mean age of patients was 59.78 ± 16.58 years. There were 37 males and 13 females. The mean duration of surgery was 40.40 ± 20.86 min. The mean union time was 2.20 ± 0.50 months. One (2%) patient developed deep venous thrombosis, whereas 1 (2%) patient had back out of stabilizing screw and 1 (2%) patient had implant failure. The Harris hip score at 1-year and 4-year follow-up was 92.12 and 97.92, respectively, which is slightly better than scores from other implants used for similar fracture. Conclusion: For intertrochanteric fracture fixation, trochanteric femur nail offers good functional outcome with early ambulation and weight bearing with a high rate of union and minimal complications. Intertrochanteric fracture is one of the most common fractures of the hip, especially in the elderly with osteoporotic bones, usually due to low-energy trauma-like simple falls. The incidence of intertrochanteric fractures varies from one place to another. Hagino et al. in their study reported a lifetime risk of hip fracture for individuals at 50 years of age of 5.6% for men and 20.0% for women. The conservative nonoperative treatment of intertrochanteric fractures was predominant before the advent of fixation devices. However due to high complication rate, the conservative management goes into wane. The common problems encountered were prolonged immobilization, joint contractures, varus deformity, and shortening results in poor function. After the first operative treatment of hip fracture in 1950, a wide variety of implants are now available for the internal fixation of these fractures ranging from extramedullary to intramedullary implants. Screw and side plate devices reliably stabilize stable fracture patterns., However unstable fractures require a mechanically optimized device and better implant purchase in the femoral head. 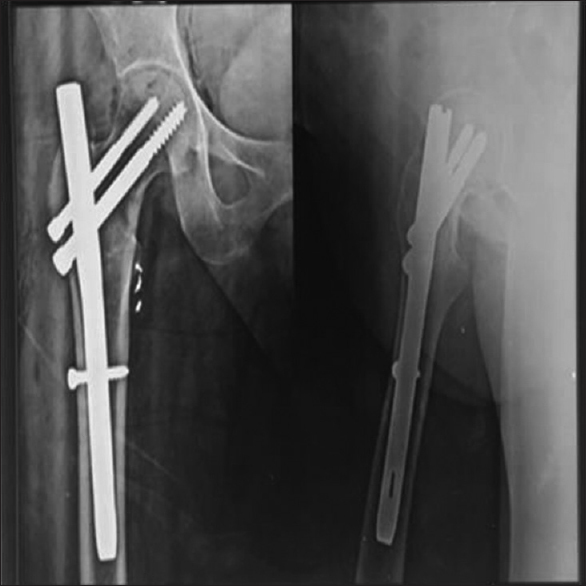 These fractures have been more prone to implant failure with standard devices such as screws and side plates., The trochanteric femur nail was developed to improve the rotational stability of proximal femoral segment, reduce intraoperative complications, and early postoperative weight bearing. The main principle of this type of fixation is based on a sliding screw in the femoral neck–head fragment, attached to an intramedullary nail that results in an anatomical reduction, stable fixation, preservation of blood supply, and early mobiliztaion. Use of trochanteric fixation nail (TFN) helps to prevent excessive fracture impaction and consecutive limb shortening prevented by this additional implant. Value of implants in preventing femoral medialization in such specific type of intertrochanteric fracture needs further evaluation. Hence, we are pursuing this study to understand the outcomes of patients treated with TFN. A retrospective cross-sectional study of patients with trochanteric fractures of the femur that were treated with TFN at a tertiary care center in Indore (India) from July 2011 to August 2016 was conducted after clearance from the Institutional Ethical Committee. Fifty-three out of 70 patients were eligible for this study, and 3 patients were lost to follow-up 1-year postoperatively. Hence, a total of 50 patients were analyzed in this study. Age more than 21 years, closed fractures, and isolated intertrochanteric fracture of ipsilateral limb were included. Fracture in pediatric age group, open fracture, pathological fracture, old-neglected fracture of more than 3 weeks, associated fracture of the ipsilateral limb. Standard preoperative planning was done. Radiographs of the pelvis with both hips anteroposterior view and traction-internal rotation view were obtained to confirm the diagnosis. All patients underwent surgery by one orthopedic specialist (the first author of the paper) with the patient in the supine position on a fracture table with fluoroscopic-guided imaging. After the patient had been anesthetized, closed reduction to a near anatomical position was performed. As a standard protocol, intravenous cephalosporin was administered intravenously before the skin incision [Figure 1]. Patients were prepared for the fracture fixation with TFN [Figure 2] through a lateral approach. Femur was reamed by hand and guidewires used in all procedures. Distal interlocking screws were placed through the nail guide for all nails. The classification used was the Evan's classification and all the fractures which were classified unstable were treated with TFN. All patients in our study underwent a similar rehabilitation protocol involving intravenous antibiotics (cephalosporin) were given for 3 days followed by oral antibiotics for another 5 days. All drains were removed by 48 h. Active and passive physiotherapy of hip, knee, and ankle started according to pain tolerance of patients. The wounds were inspected on the 2nd postoperative day. Stitches were removed between 10th and 14th postoperative day. Non-weight-bearing was started on the 2nd postoperative day with walker support, whereas partial weight-bearing was started at 2 weeks and full-weight-bearing walking was started after 6 weeks. The patients evaluated at 6 months, 1–4 years postoperatively and assessed using the Modified Harris hip score. All patients were followed up for a minimum period of 4 years. The mean age of patients was 59.78 ± 16.58 years. The eldest patients age was 87 years and the youngest patient was 43 years. There were 37 males and 13 females. Out of 50 patients, 36 (72%) patients suffered fracture due to trivial trauma-like fall in the bathroom, whereas 14 (28%) suffered road traffic accident. Three (6%) patients were diabetic, whereas 17 (34%) patients had hypertension. The mean duration of surgery was 40.40 ± 20.86 min. The mean perioperative blood loss during the surgery was 75.4 ± 26.4 ml. Patient distribution according to fracture type was 40 (80%) patients had unstable fractures and 10 (20%) patients had stable fractures [Table 1]. Union time was evaluated radiologically by observing the callus formation at the fracture site in at least three planes. The mean union time was 2.20 ± 0.50 months. Perioperative complications recorded include 1 (2%) case of deep venous thrombosis due to the long duration of bed rest, whereas 1 (2%) patient had back out of stabilizing screw due to unknown cause and 1 (2%) patient had implant breakage due to fall again. The mean Modified Harris Hip Score at final follow was 97.92 ± 5.86 [Figure 3]. The patients were followed up for different intervals with a minimum follow-up of 4 years. Two patients were lost to the follow-up and 1 patient died during the study. The average follow up time was 4 years. Pre op Xray [Figure 4]. Post op xray [Figure 5]. Follow up xrays [Figure 6]. Clinical images at final follow up [Figure 7]. Unstable intertrochanteric fractures in the elderly continue to be a tremendous public health problem regarding patient mortality, morbidity, and burden to the health-care system. The mean age was 57.62 ± 15.78 years. However, some earlier studies done by Sonar et al. and Gill et al., shows relatively older age group in comparison to our study. The frequency of trochanteric fractures in a relatively younger age group in this series may be related to the shorter life expectancy of the population and high-velocity trauma causing the fracture in several younger patients in the study. There was a male preponderance in comparison to the females. This finding in the present study is similar to a various published article such as in a study by Patil et al. which indicate a preponderance of male patients. The reverse obliquity fracture and the intertrochanteric fracture with subtrochanteric extension are relative contraindications for dynamic hip screw (DHS) fixation due to their high rate of failure. Given all these limitations to DHS, nailing has shorter lever arm with reduction in bending stress and lower implant failure rate and makes no dissection at the fracture site. The nail occupies the medullary canal, preventing excessive sliding and medialization of the shaft. It also covers all the other fracture patterns-like reverse obliquity, and intertrochanteric fracture with subtrochanteric extension effectively. After TFN fixation, by the 2nd week, partial weight bearing was allowed in 70% of patients and full-weight bearing was allowed to 30% of patients by the 6th week, whereas in a study by Jonnes et al. partial weight bearing was started by 7.87 and 3.73 weeks and full weight bearing by 11.83 and 7.93 weeks for DHS and PFN, respectively. Mean Harris hip Score at 1 year follow-up was 92.12, however in a comparative study by Jonnes et al. between PFN and DHS showed results of 89.08 and 90.33, respectively, which is slightly lesser than our study. The range of motions in flexion, abduction, and internal and external rotations was good to excellent in most of the cases operated. The fair and range of motion were attributed to the poor compliance of the patients for regular physiotherapy. We conclude in our study that with the proper patient selection, good instrumentation, and surgical technique, TFN is a good choice in the management of intertrochanteric fractures leading to high rate of bone union and good functional result with early mobilization and weight-bearing and minimal complications. Dimon JH, Hughston JC. 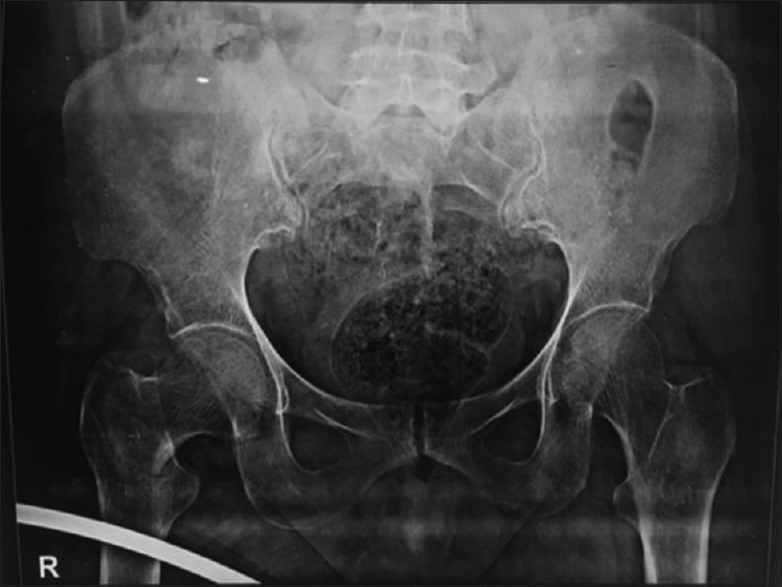 Unstable intertrochanteric fractures of the hip. J Bone Joint Surg Am 1967;49:440-50. Dhanwal DK, Dennison EM, Harvey NC, Cooper C. Epidemiology of hip fracture: Worldwide geographic variation. Indian J Orthop 2011;45:15-22. Hagino H, Furukawa K, Fujiwara S, Okano T, Katagiri H, Yamamoto K, et al. Recent trends in the incidence and lifetime risk of hip fracture in Tottori, Japan. Osteoporos Int 2009;20:543-8. Kyle RF, Cabanela ME, Russell TA, Swiontkowski MF, Winquist RA, Zuckerman JD, et al. Fractures of the proximal part of the femur. Instr Course Lect 1995;44:227-53. Parker MJ, Pryor GA. Gamma versus DHS nailing for extracapsular femoral fractures. Meta-analysis of ten randomised trials. Int Orthop 1996;20:163-8. Larsson S, Friberg S, Hansson LI. Trochanteric fractures. 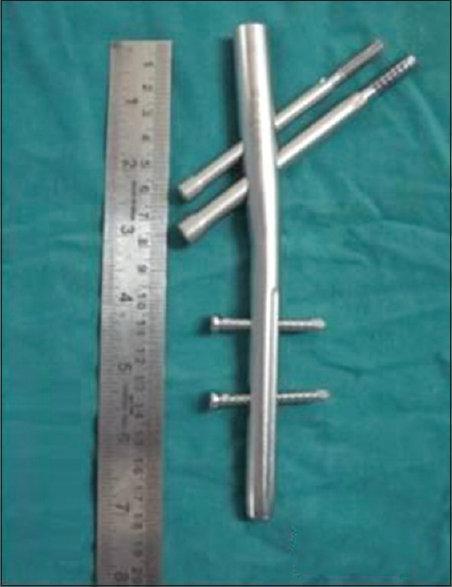 Mobility, complications, and mortality in 607 cases treated with the sliding-screw technique. Clin Orthop Relat Res 1990;2:232-41. Adams CI, Robinson CM, Court-Brown CM, McQueen MM. Prospective randomized controlled trial of an intramedullary nail versus dynamic screw and plate for intertrochanteric fractures of the femur. J Orthop Trauma 2001;15:394-400. Jonnes C, Sm S, Najimudeen S. Type II intertrochanteric fractures: Proximal femoral nailing (PFN) versus dynamic hip screw (DHS). Arch Bone Jt Surg 2016;4:23-8. Knobe M, Gradl G, Ladenburger A, Tarkin IS, Pape HC. Unstable intertrochanteric femur fractures: Is there a consensus on definition and treatment in Germany? Clin Orthop Relat Res 2013;471:2831-40. Sonar UV, Ingle MV, Koichade MR, Yelne AB, Malu N. Comparative study between trochanteric fixation nailing and cemented bipolar hemiarthroplasty for the treatment of unstable osteoporotic intertrochanteric neck femur fractures in elderly patients. IOSR J Dent Med Sci 2014;3:31-40. Gill JB, Jensen L, Chin PC, Rafiei P, Reddy K, Schutt RC Jr. Intertrochanteric hip fractures treated with the trochanteric fixation nail and sliding hip screw. J Surg Orthop Adv 2007;16:62-6. Patil P, Shah J, Gunaki R, Lokare N, Gor R, Koli V, et al. A study of unstable intertrochanteric fractures treated with trochanteric fixation nail. Int J Curr Res 2006;8:30742-8. Brammar TJ, Kendrew J, Khan RJ, Parker MJ. Reverse obliquity and transverse fractures of the trochanteric region of the femur; a review of 101 cases. Injury 2005;36:851-7. Saudan M, Lübbeke A, Sadowski C, Riand N, Stern R, Hoffmeyer P, et al. Pertrochanteric fractures: Is there an advantage to an intramedullary nail? : A randomized, prospective study of 206 patients comparing the dynamic hip screw and proximal femoral nail. J Orthop Trauma 2002;16:386-93. Sadowski C, Lübbeke A, Saudan M, Riand N, Stern R, Hoffmeyer P, et al. Treatment of reverse oblique and transverse intertrochanteric fractures with use of an intramedullary nail or a 95 degrees screw-plate: A prospective, randomized study. J Bone Joint Surg Am 2002;84-A: 372-81. 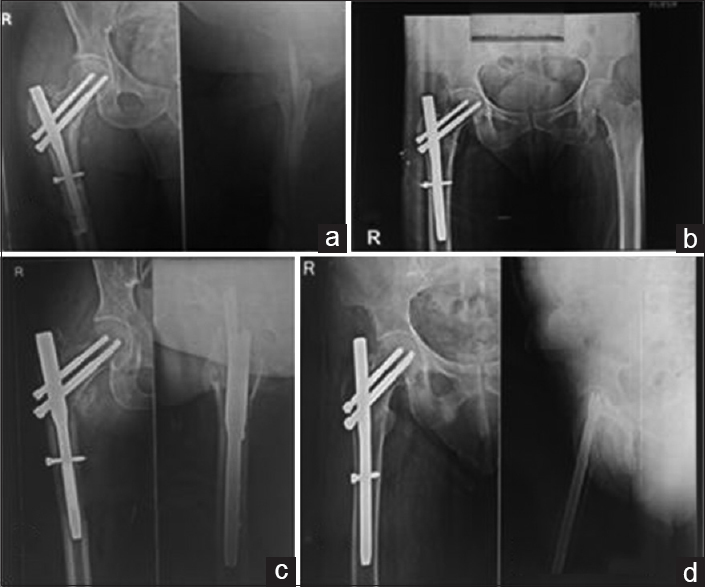 Bhandari S. Proximal femoral nail for unstable peritrochanteric fractures a panacea? J Maharashtra Orthop Assoc 2005;2:69-72. Tronzo RG. Surgery of Hip Joint Volume II of Surgery of the Hip Joint. 2008. Endigeri P, Pattanashetty OB, Banapatti DB, Pillai A, Ullas T. Outcome of intertrochanteric fractures treated with proximal femoral nail: A prospective study. J Orthop Traumatol Rehabil 2015;8:25-9. Mardani-Kivi M, Mirbolook A, Khajeh Jahromi S, Rouhi Rad M. Fixation of intertrochanteric fractures: Dynamic hip screw versus locking compression plate. Trauma Mon 2013;18:67-70. Bhakat U, Bandyopadhayay R. Comparative study between proximal femoral nailing and dynamic hip screw in intertrochanteric fracture of femur. Open J Orthop 2013;3:291-5. Nargesh A, Tiwari A, Muhammad S, Mehra A. Comparative study of the management of inter-trochanteric fractures in the elderly: Short proximal femoral nail vs. dynamic hip screw. Sri Lanka J Surg 2012;30:13-7.